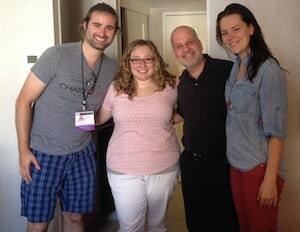 StutterTalk host Barry Yeoman joins Joel Korte, Caryn Herring and Roisin McManus of the StutterTalk B Team at the 2014 annual conference of the National Stuttering Association (NSA) in Washington, DC. The StutterTalk crew talk about facing conference anxiety and stuttering anxiety. Barry points out the internal work that conference participants do while surrounded by hundreds of other people who stutter. The B Team hosts talk about how powerful and meaningful they found Barry’s storytelling and movement workshop. Barry is asked to discuss the National Stuttering Project (NSP) which preceded the NSA and the changes he has seen in the self help movement. This StutterTalk episode was recorded and published Friday, July 4th on the third day of the NSA’s annual conference.